Biasing your Fender Deluxe Reverb is an easy process that can drastically improve its tone and prolong the life of the expensive power tubes. By adjusting the bias of each tube within an acceptable range, you can go from a weak tone to a powerful, overdriven blues tone. You can also choose to lower the bias to obtain more headroom and a cleaner overall sound for country or jazz playing. With just a biasing probe and a screwdriver, you can make a noticeable difference to your guitar tone. Carefully remove the back cover from the Fender Deluxe Reverb amp. There should be six screws. Set them aside. You will see the power tubes that should be biased to the right. Tip the amp forward to get easy access to the tubes for removal. Remove the first power tube from its socket. In order to make sure you do not break the tube, carefully wiggle it from side to side until it comes out of its socket. You want to make sure your hands are clean, as you do not want to deposit grease or debris on the glass part of the tube because it can cause it to fail. Set the tube aside on a clean cloth. Place the tube in the bias probe by aligning the prongs with the corresponding holes in the probe. The bias probe is the plastic round piece that will sit between the tube and the socket to accurately read the voltage for you to adjust the bias. 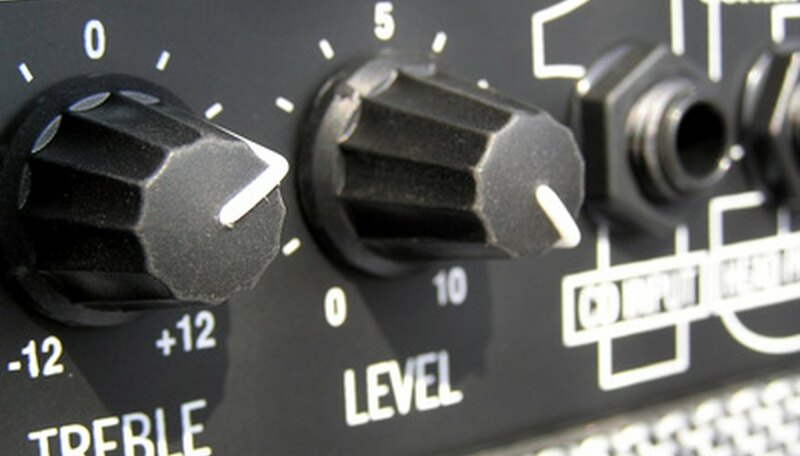 Adjusting the bias will prolong the life of your power tubes as well as make your amp sound its best. Place the bias probe with the tube in the power tube socket where you removed the tube in Step 1. Turn on your amplifier and allow to warm up for a few minutes before continuing. Look at your voltage monitor; you want the reading to be in between 22 and 28mA. Locate the bias adjustment screw, which should be close to the first tube, probably right behind it. Place a screwdriver in the hole and adjust the voltage until it is in this range. If you get closer to 28mA, you will have a grittier tone. Closer to 22mA will provide a clean, warm tone. Repeat Steps 2 through 5 for the other power tubes, adjusting the voltage evenly across all of the tubes.